From now on whenever I think of lemon bars I’ll be reminded of the time that I first met a group of cousins I never knew I had. We all convened at my parents’ house (it turns out they don’t live that far away) for dinner the day after Christmas, just ten days ago. Their great-great-great-grandfather was my great-great-grandfather. I did the calculation and determined that makes us 3rd cousins once removed. It’s a distant relation, but family is family. One of my “new” cousins, about my same age, brought over lemon bars that day. I hadn’t had them in forever and hers were fantastic. I learned that both she and her sister love to cook and that her sister even has her own special occasion cake business. Even though we’re only 3rd cousins once removed I felt connected over this. 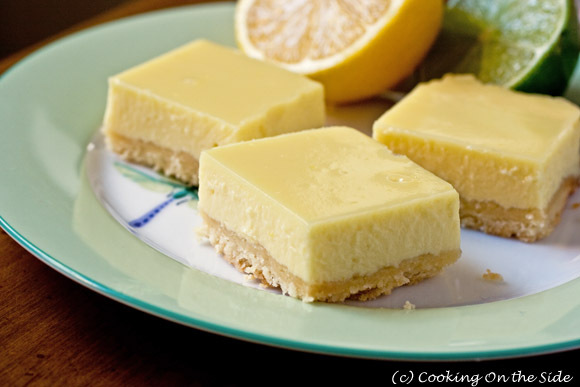 This little reunion prompted me to share a recipe for Creamy Lemon-Lime Bars today. The recipe, which I adapted from the side of a can of sweetened condensed milk, is more reminiscent of key lime pie than the traditional lemon bars my cousin made. 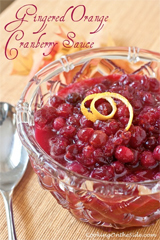 They have a rich, creamy texture but are still very sweet, tart and refreshing. I brought limes into the mix to make things a little interesting (plus I love limes). Adapted slightly from the Luscious Lemon Squares recipe on the side of the Safeway Sweetened Condensed Milk can. Preheat the oven to 375°F. Line an 8-inch square pan with heavy foil, allowing it to extend over 2 ends. In a medium-size microwave-safe bowl, melt the butter. Stir in the flour, sugar and salt until crumbly. Press the crust into the bottom of the pan. Bake for 15-20 minutes or until golden. Cool 5 minutes, but leave the oven on. Meanwhile, in a large bowl, whisk the lemon and lime juices, milk and eggs until blended. Pour over the crust. Bake for 20-25 minutes or until the center is set. Cool completely. Lift foil with pastry to a flat surface. Dust the top with powdered sugar and cut into squares. What fun to discover a bunch of cousins you never knew you had! And how nice that you can share your love of cooking with them. Honestly, who doesn’t love lemon bars?!? This looks just like how my grandma used to make them. These are going to be a hit at our house! Anything with lemon or lime is my favorite dessert; sounds delish! 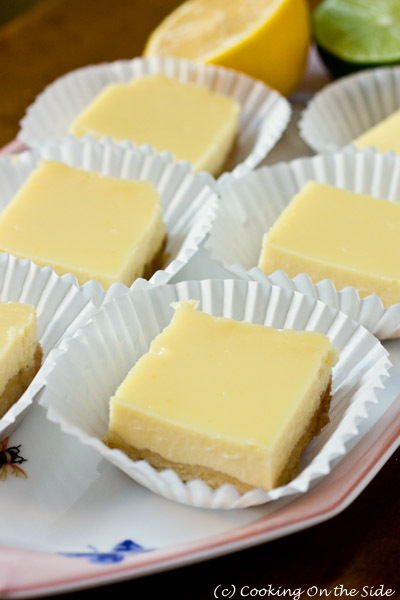 I love lemon bars, and these look FAB. Can’t wait to try them. Lime for an extra kick sounds GREAT. I love lemon bars! Adding lime to them sounds so yummy, too! These lemon-lime bars look fabulous. 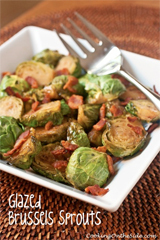 Adding them to my list of To-Try recipes! And good for you meeting new family. This is such a coincidence, I just woke up in the middle of the night with a craving for lemon squares. I got up to search online for recipes and after finding a bunch of suspicious looking recipes, I gave up and closed all of the pages. Then I looked over at my Top Sites and saw a screenshot of your site and what looked like lemon squares. Lo and behold! I always prefer your recipes (and the Neelys), before searching elsewhere. By the way, that third, sixth, eighth cousin, removed two, ten, twenty times has no meaning in my culture. My folk are from the south, we’re African-American and a cousin is a cousin, an aunti is an aunti, and big mama’s big mama no matter how close or distant the relation. My husband is African, from central Africa, and he says the same principle is used throughout Africa, so we know where it comes from. Family is family no matter how close or how distant the connection. I’ve never understood these rules they use out in the US/Europe – second, third, fourth cousins removed once, two, three times. Lol, what kind of crazy?? It’s family! Never even heard of those rules till we moved to the big city. Lawd. What a wonderful story, Kathy. How fun to be connected with relatives, distant or not. These bars look wonderful! Thank you! I couldn’t remember what brand of condensed milk I had seen this recipe on, and had lost it. I like it better than the others I’ve tried. I also recently met some distant cousins (4th and 5th! ), and food was also a big part of the reunion (they’re Lebanese, and hosted, and did all the wonderful cooking). I love lemon but have never had these before – do you serve them at room temp or refrigerated? how do you store them? Thanks and sorry for my ignorance! Hi Theresa – Since they’re custard based I prefer to keep them in an airtight container in the refrigerator. Thanks! having the girls over next week for lunch I can’t wait to give these a try! I am baking these right now… I didn’t have limes so am just making a lemon version. I hope they taste as good as they look when we eat them this afternoon. 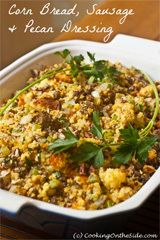 I have this in the oven right now! I can’t wait to taste it. I didn’t notice the 1 tbs. of granulated sugar until after I put the crust in the oven, since it is not listed in the directions. I should have realized the crust needed sugar, but alas, it is late. where did the tablespoon of sugar go in the directions????? It goes in the crust – sorry about that, I’ll update the recipe right now. Delicious! These are the perfect springtime dessert with their rich, creamy texture and their bright lemon flavor. So easy and so good! Is 2 large eggs correct? Martha Stewart uses 4 large egg yolks in her very similar recipe…hmmm. I want to be sure! Thanks.